The day should begin with Limmudei Kodesh. Limudei Chol should be later in the day and for fewer hours than Kodesh (Igros Kodesh 12, pg. 190 and numerous other sources). During times of vacation from general studies, there should be an increase in Limudei Kodesh (Igros Kodesh 20, pg. 273). 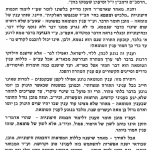 As such, Lev Tmimim puts an additional emphasis on Limudei Kodesh during times of Bein Hazmanim, and summers. Click here for the סדר היום or see below for more details about the curriculum or go back to Home page to read about the the Limudei Kodesh curriculum. The general studies curriculum is designed to allow the Bochur to learn certain skills and acquire basic knowledge that will both prepare him for the NY State Regents diploma exams, as well as allow him to use this knowledge in the service of his Shlichus and Parnasah in the future. Due to the fact that our Talmidim are coming from a large of variety of Chabad Mosdos, some including General Studies in elementary grades, while others not, we realize that our Talmidim will be starting Mesivta with significant variation in their knowledge and skills. In order to allow each Talmid to truly succeed in this area, we utilize a very successful model of teaching called Blended Learning. Blended learning utilizes the advantages of having a teacher who is personally involved with the students to help guide them, as well as the advantage of online courses that enable each student to work at their particular level and speed, and focus on the specific subset of skills in any particular subject they are studying. This model is becoming very popular and successful in schools across the country, including many Yeshivos and day schools. Learn more about blended learning here. This includes 1 credit given for a NY State standardized Regents exam. Algebra 1 and 2, Geometry, or Trigonometry, or other credit equivalent courses. Life Science, Physical Science, or other credit equivalent courses.